For starters signing up for a new account, Skydrive offers 7 GB worth of free space while Dropbox offers only 2 GB. So as far as the free space is concerned on a new basic account sign up, sky drive wins by a long margin. Next, we will take a look at the pricing for the two. Skydrive not only beats dropbox but almost all the other major competitors when it comes to pricing. For $10, add 20GB worth storage. If a person wants to add 100 GB on dropbox, he’d have to pay $99 for that. The same 100 GB on Sky drive is available for half the price that is $50. Another drawback that Dropbox has that it doesn’t allow you to work seamlessly with Microsoft Office products. If you view the files online on dropbox.com, it only allows you to view them but it doesn’t let you edit them online. Sky drive not only allows you to work with Ms Office online but also allows you to edit online at the same time with other users. If we talk about platforms the two are available on, dropbox isn’t available on windows phone while Sky Drive is. 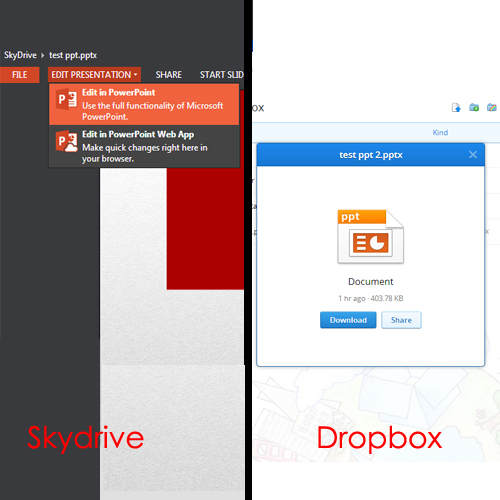 Sky Drive allows the feature of remote desktop while it is missing in Dropbox. Remote Desktop allows you to get to your files and apps from anywhere. 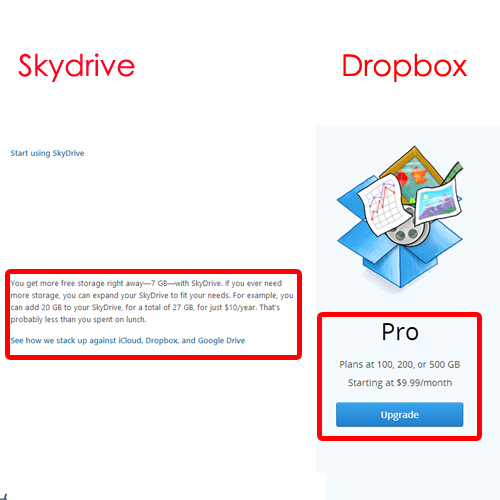 With all these features and pricing that Sky Drive has to offer, it clearly has an edge over Dropbox. 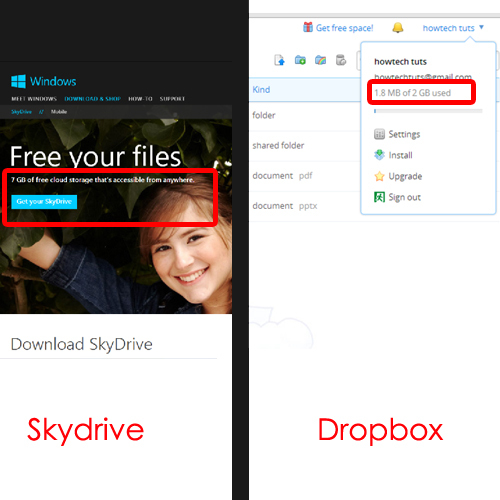 Hope you found this comparison between Dropbox and skydrive useful.